There’s blood in that pale, sinewy hand. Blood and resolve. Idle for now, it won’t stay that way for long. It’s poised for action. The hand belonged to Ellen Day Hale, who painted it herself in 1885. It’s part of a self-portrait, one of the best in the Museum of Fine Arts, where it hangs in the Art of the Americas Wing, in a gallery devoted to the so-called Boston School. Like all the other works in this gem of a gallery, the work is pleasing to look at. It’s easy to appreciate the loosely brushed blue background with its scattering of parti-colored blossoms; the big round ostrich feather fan in the foreground; the rich array of blacks. But before you can register this — before “taste” and “design” have a chance to announce themselves — what arrests your attention is all psychological. Hale appraises us with intelligent, unforgiving eyes that won’t let us go. She is not interested in foolishness or play acting. 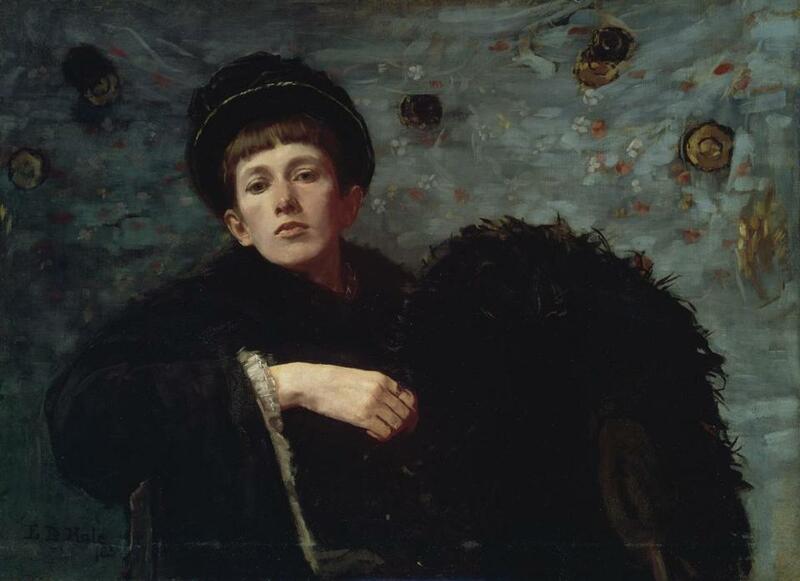 Both her tilted head, so dramatically and brilliantly rendered, and its off-center position enhance the portrait’s immediacy. Like Edgar Degas’s breakthrough 1865 portrait, “Woman Seated Beside a Vase of Flowers,” which shows a woman simultaneously sidelined and made more vivid by a huge bunch of flowers, it increases the sense we have that this is a real woman occupying space in real time — as opposed to “portrait time,” which is imaginary. Hale gives us no choice. You glance in the painting’s direction, and almost hear the whoosh and click, like a magnet hoovering up metal. Hale had just returned from Paris when she painted it. She was born in Worcester into a distinguished Boston Brahmin family (her great aunt was Harriet Beecher Stowe) on Feb. 11, 1855. She died on the same day 85 years later. Her brother was the artist and critic Philip Leslie Hale, who married the wonderful painter Lilian Westcott Hale. She was around artists, writers, educators, and women’s suffragists a lot. She studied art with William Rimmer, and then with William Morris Hunt and his co-teacher, Helen Knowlton, who had a special impact, before furthering her studies in Philadelphia and Paris. She never married, but in 1883 she met fellow artist Gabrielle DeVeaux Clements, with whom she later settled down in a house called “The Thickets” in Gloucester. What, I still wonder, is the look she is giving me, as I stand before this self-portrait? I could throw words at it: disdainful, intolerant of fools, appraising, anxiously tender. But none will stick; all seem less than half-true. In any case, she is not looking at me. She is looking at herself. What she saw there probably surprised and engaged her as much as it does me.